I had some work to do before fitting the engine. 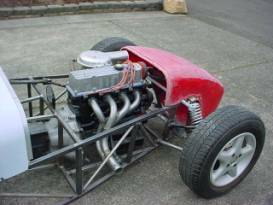 The 2.3 liter ford has a very deep sump, which makes the overall engine height way too tall. This is about to be given a little surgery to remove the ponderous bottom. A little careful work with a saber saw yields a very shallow, but very leaky pan. Unfortunately, I didn’t take a picture of the wide “box” that was later welded to the opening. It formed what is normally called a winged sump, and still holds the 5 quarts of the original. 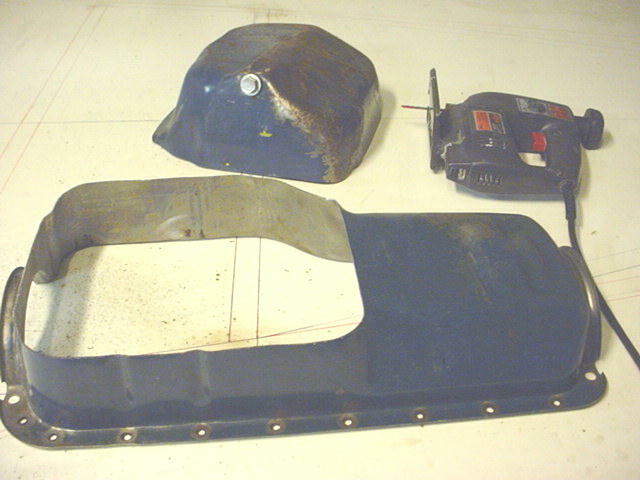 To minimize oil sloshing, the “box” was given baffles to hinder side-to-side and for-and-aft oil sloshing. It also got a built-in windage tray. You can see the end result in some of the following pictures. After removing about six inches of sump, I added back only 1-3/4 inches, however it was much wider. Now, the overall height of the engine is only about 22.5 inches - still tall, but better than nearly 30. This give a somewhat obstructed view of the pan modification. It's nearly 5 inches shorter. I replaced the Ford alternator with a small Nippondenso internal fan unit and put it on the opposite side. There are several versions of this small, internal fan unit, but this came from an 89 Toyota pickup. Even smaller units come from forklifts, but this was a low cost item from a local wrecking yard. 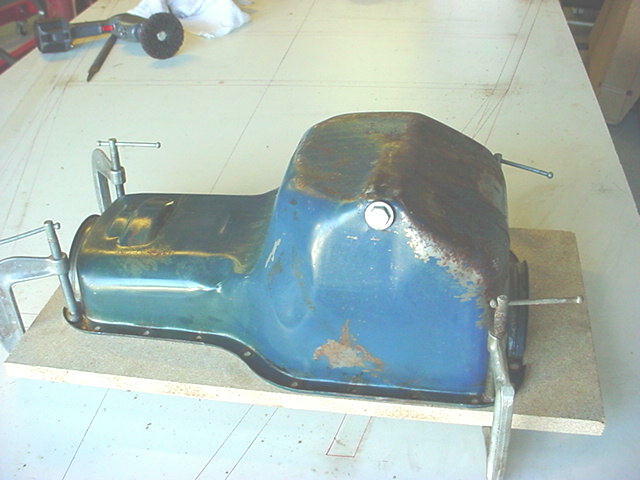 The upper and lower mounts were fabricated from scratch. The lower one can't be seen but was welded from 1.5" by 3/16" thick steal, and provides a solid pivot point. The upper bracket was made from #/8" alluminum plate, and the adjuster has two spherical joints, one LH and one RH thread. Nuts welded to opposite ends of a small tube make a turnbuckle for easy belt tension adjustment. Jam nuts lock things in place. The string is a way to find the drive belt length -- 34". The original carburetor base plate was cast with a mount for the EGR valve. It was very think, and raised the carburetor above the top of the valve cover. This put the air cleaner dangerously close to the bonnet. Earlier I had made a block-off plate for the EGR port, but it looked ugly and did nothing to make a smaller power plant. Here you can see the bright, new baseplate under the carb. It might not be clear to you, but I really notice how much lower the carb is now. Just behind the timing belt is an oil catch can from Jaz. It only holds a pint, but I'm sure I won't need more volume because there is a drain valve at the bottom. I don't plan to run PCV to the intake, but if I do, it would be a simple matter to block the can's breather port, and use the extra vacuum fitting (left side of can). I scrapped the original clutch cable in favor of hydraulics. The CNC and Willwood units are identical in size and shape, and they both pull. My selection of CNC was highly scientific - a local dune buggy shop had one in stock, I had to order a Willwood. As I recall price was about the same. The CNC unit came with a stainless rod for the "fixed" end. I shortened and threaded the end for the spherical joint. I shortened the throw out yoke and welded a bolt for the other spherical joint. I didn't like it and changed the design. Now the end of the yoke has two horizontal ears the spherical joint fits between. A clevis pin drops through the ears and spherical joint - much cleaner. This photo needs updating. It was a nice change of pace to fabricate the exhaust header. Primary tubes are 1.75 inch exhaust pipe in the form of a Tri-Y (4-2-1). The small pipes all funnel into a 2.25 inch pipe. Eventually this bad boy will get ceramic coated. It should last longer and keep the under-hood temperature down. This photo also shows a change to the book frame. In the book, the panel where the exhaust exits has a single triangulation tube. I decided to add some stiffness here for two reasons. One, the 2.3 L engine is pretty heavy and develops a lot of torque. Two, the top and bottom tubes are long and unsupported which allows those tubes to flex. The added triangulation should add a lot of stiffness to the front.